However, it's had a bit of a reputation for not being very user friendly to set up a React app, particularly for beginners. The problem stems from when React first became popular, and the standard method of creating a React app involved complex manual configuration of a whole host of setup files. Once comfortable with these tools, you'll have the confidence to use them to their full potential and create in-depth complex apps. Until then, there still remains an entry barrier to a lot of developers who haven't necessarily got experience with the command-line tools needed to create React apps. To help alleviate this frustration, this tutorial series focuses on various methods for setting up React apps. We'll start with the most basic approach and then build up to more complex setups. Let's kick things off, though, by clarifying in more detail the types of React setup we'll be covering. The first method demonstrates how to use an online code editor such as CodePen to set up a React app very quickly. Using this method, you'll be coding your first app literally in seconds! Then, we'll move on to setting up React in a local development environment, starting with directly adding scripts to an HTML file using no build tools whatsoever. The next two setup methods focus on how you'd set up a typical React app in your day-to-day development. As you'll see, using the create-react-app tool makes it extremely easy to spin up React apps with just a single command! Finally, we cover how to set up a React app via the command line completely from scratch, the old-school way. Each setup method has its place, and there's no single 'better' approach, just alternatives depending on your needs. React is a fantastic library to build web apps with, and it's a lot of fun too! Let's take a look now at the tutorial prerequisites to make sure you're up to speed. The simplest method for setting up a React app requires nothing more than an internet connection. However, as we progress to more complex setups, we'll be moving towards setting up a React app completely from scratch. Therefore, some knowledge of the following topics is recommended. Windows, macOS, and Linux all provide access to command-line tools. These are used heavily in modern web development for completing complex tasks quickly and efficiently. If you don't have any experience working with the command line to perform operations such as managing files/folders, installing tools, running scripts, and so on, then it would be worth your time at least learning the basics. This tutorial series focuses on setting up React apps rather than developing them, and so we won't be delving too deeply into React specific topics such as components, props, and state. 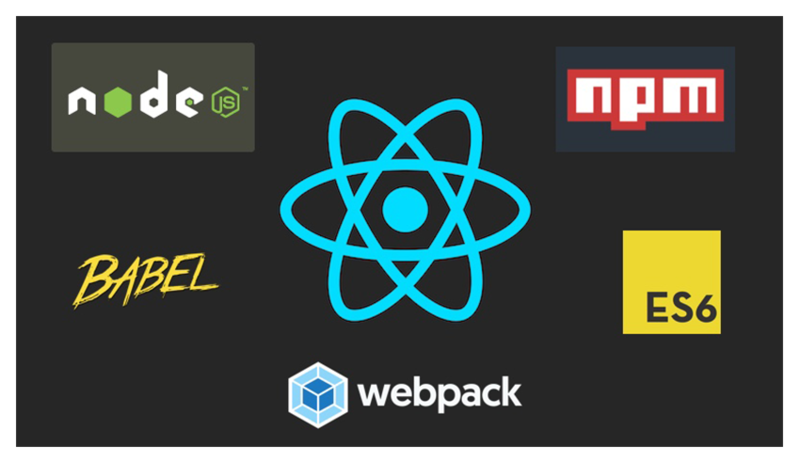 It's a good idea, though, to have some basic knowledge of what these are, so in the next section we'll be covering the basic features of React and exploring how all the parts fit together to form a working app. Before we dive into our first setup method, let's take a quick tour of React itself. These are the key features you need to master in order to write effective React apps. Once you've reached that stage, you'll be very well prepared to dive much deeper into React and develop more complex apps. To make constructing components easier, JSX was created to give components an HTML-like structure. If you're familiar with HTML or XML then you'll be right at home using JSX to build components. It's worth noting that you are not required to use JSX at all in React, but it's now become the accepted standard way to define components. Let's take a closer look at our <BookIndex /> React component example and see how we can define it with multiple nested child <Book /> components. At the same time, we'll pass down information to each individual <Book /> component from <BookIndex />. If the above syntax for creating React components looks strange, don't worry—it's pretty straightforward. An ES6 class extends the base component class, and then a (required) render method handles the output of the component. State is typically applied to the top-level component in your React app, so that it's available to every child component to consume state data as necessary. That's it for our whirlwind tour of React. It's by no means comprehensive, and there's a lot more you need to learn before you can create fully fledged complex apps, but understanding components, props, and state will give you a solid head-start. In this tutorial, we laid the groundwork for learning how to set up a React environment. The rest of this tutorial series focuses on the specific methods needed to do this. We'll cover setup methods ranging from very simple to more complex methods requiring manual configuration. In the next tutorial, we'll start by taking a look at using CodePen, an online code editor, to set up a React app in just a few mouse clicks. This is by far the simplest and quickest way to get coding in React!